The Conference Board of Canada plagiarism and undue influence story – which with the Board’s report and overdue apology to Curtis Cook will now go on hiatus until new reports are issued in the fall – has obviously attracted considerable interest. Looking back, while plagiarism is rare, it is the public airing of the copyright lobby policy laundering effort that is the far more important development. Although there are many groups involved in copyright lobbying, at the heart of the strategy are two organizations – the Canadian Recording Industry Association and the Canadian Motion Picture Distributors Association. CRIA’s board is made up the four major music labels plus its director, while the CMPDA’s board is comprised of representatives of the Hollywood movie studios. Those same studios and music labels provide support for the International Intellectual Property Association, which influences Canadian copyright policy by supporting U.S. government copyright lobby efforts. – will be responsible for creating policy programs to promote the protection of IP and increase innovative capacity, such as education programs targeting youth as well as an awareness campaign for businesses and consumers Establish an Intellectual Property Rights Coordination Council consisting of senior government officials, representatives from the business community, and IP rights holders. The Council should develop and implement a robust IPR framework that promotes the creation and exploitation of innovative products and services in Canada. IP Inter-ministerial coordination council: comprising high-level representatives from the IP sector; would create policy programs to promote the protection of IP; would enforce key elements such as exposing the dangers and risks to consumer health and safety, highlighting the relationship between IPR crime and organized crime, providing information and resources to SMEs, and creating programs to exploit IPR. – will work with border officials to address counterfeit products detected at border crossings Establish a specialized IP Crime Task Force to guide, coordinate and lead anti-counterfeiting and anti-piracy enforcement efforts in Canada. IP Task Force: comprising individuals dedicated to IP-related crime; would coordinate enforcement and prosecution activities against counterfeiters and pirates; would work with CBSA to track counterfeit products. authority and resources needed to target, detain, seize and destroy counterfeit and pirated goods on its own initiative. Federal and provincial governments should provide additional funding and training to all relevant enforcement authorities for enhancing IPR protection. IP Council According to a study commissioned by the Business Software Alliance (BSA), losses to the Canadian economy due to software piracy surpassed $1 billion in 2007. Business Software Alliance. News Release. “BSA Urges Stronger Copyright Legislation To Reduce Impact of Piracy on Canadian Economy.” May 14, 2008. It is not just that these reports all receive financial support from the same organizations and say largely the same thing. It is also that the reports each build on one another, creating the false impression of growing momentum and consensus on the state of Canadian law and the need for specific reforms. Consider the IP Council’s A Time for Change, which was released in early 2009. The very first chapter of the report is titled “Canada’s Emerging Consensus on Intellectual Property Rights.” Where does this consensus come from? 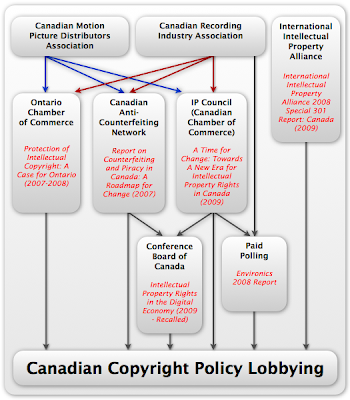 According to the IP Council, it starts with the CACN report, followed by two House of Commons committees that heard primarily from these groups and which led to the 2007 Speech from the Throne and Canada’s participation in ACTA. The chapter then states that IPR policy was taken to the “next level” with the Ontario Chamber report, the founding of the IP Council, and the 2008 Conference Board of Canada conference that led to the three recalled IP reports. The chapter then notes the “growing public awareness of the need for action” which cites Environics polls (paid for by the IP Council) and a Toronto Star supplement on counterfeiting (paid for by the CACN). In all, the IP Council cites the CACN four times, the Ontario Chamber twice, the Conference Board of Canada proceedings 13 times, and the Environics research five times. At a certain level, none of this will come as a surprise. Companies lobby for their position and what made the Conference Board of Canada series of events so unusual was the way in which it was exposed. Yet the Conference Board of Canada’s recalled reports were clearly just a part of a much larger strategy to influence Canadian copyright policy by creating a narrative of crisis and the false impression of Canada as a piracy haven. This week’s comments from Industry Minister Tony Clement and Canadian Heritage Minister James Moore provide the strong sense that they better understand the current dynamic around copyright, but it is obvious that the lobbying on the issue is only going to intensify in the months ahead. Micheal Im in complete awe that you have taken your precious time to share this information. Unsurprisingly this is what most already knew, just never took the time (as you have) to point it out. Once again your persevereance of the truth is inspiring. I have to admit this would have made me chuckle if it wasn’t so sickening. captcha phrase: charcoal found . IRONY…..
what specifically is this about? are they creating a new copyright bill? Loss to the software industry? How much of the loss posted is actually due to piracy? Seems to me that most jobs were outsourced to nations with no wage laws and shoddy human rights records. The taxes collected from workers in Canada in the software industry are no more due to corporate greed. These business types are not exactly know for being upfront and honest. I call BS. Wouldn’t it be useful to show the major players in the CMPDA, CRIA, etc.? I suspect some of them can be traced back to the USA. I thought the Canadian CDMA was mostly written by U.S. interests, but maybe I’m misremembering. I am left in awe at the arrogance and willful contempt that these corporations are showing to their customers and fellow citizens. Karma is unforgiving and these RIAA corporations have had it coming since Napster so let them play their dirty games but when WE THE PEOPLE decide enough is enough they won’t be able to sell their products to anyone because their customers will hate them so much for what they have done to them in the past. In the end it’s all about the fight to save our Canadian culture and how it’s being stolen from us by giant and organized American corporations. Almost a bad horror movie plot but it’s real. Thank you Mr. Geist for a very informative article. The rest of us walk. Exposing this for all to see is the next step share this piece with friends. I shall be writing my MP about this and this past Thursday. It’s time I got involved, this is a major strike against Representative Government and Government by the People. Again thanks for all your amazing work, no one else is speaking for the masses on this matter besides you it seems. Ironic since I remember voting for my MP and not the CMDPA or CRIA. I am concerned though that its just you doing this work, while they apparently seem to have a small army spewing their lies. Please write an article on where you are getting your reports from, perhaps a small volunteer group can also filter through items. We can then get multiple people blogging and writing about these matters. Can someone also please tell these organizations that the CRIA doesn’t represent the music industry as a whole. I’m a bit disappointed to see the Ontario Chamber’s position on this. Remind me not to renew my membership. I love when they talk about losses. The part they never mentioned is the one about where these “losses” go? Do they supposedly leave the country? Oh, right. We’re consumers. When the money is “lost” it just goes elsewhere within the country. This is why there are so many loopholes in the “money lost” idea. If everyone was making a profit off “illegal copies” then there’d be real money lost. However, since we’re just getting it for free and spending elsewhere, the money is still going back into government taxing and what have you. Also, good writeup, maybe people will realize soon that they are colluding. Does Canada have laws against this type of collusion? the term is to ‘buffalo’ here, i think. didn’t get a mention. It is a communication system, after all. for being on our side! Very disappointed with Environics being tied to this. Likely a whole lot less than they claim. The Business Software Alliance is an American-based front group for large software companies in the US (Microsoft, Adobe and Autodesk are the main contributors), who are paid to find and punish copyright infringement. I’d believe one of their arguments about as much as I’d believe an argument about copyright from the CRIA. That works out to about $1 billion worth of “theft” for each and every Canadian. Well I have not copied any IP, neither has my wife, so some louse is doing lots for both of us if these figures are true. But I have purchased CD’s directly from Canadian artists at their concerts. These are talented Canadians (who record and produce their own CDs) that the recording industry lobbyists have never heard of. Linux Kid: not sure what you meant to say, but $30 billion / $30 million = $1000. And ya, that’s a ridiculous amount. The lobbyists and their patrons probably have dart boards with Dr. Geist’s image at the bulls eye since he and his researchers, and peers, have diligently reminded us about the pack of lies (oops … mis-truth) emanating from these individuals and organizations. Is there an english word that describes individuals who sell their soul, moral integrity, nay – their bodies for money? … Gez/Linux Kid: $30 billion / 30 million = $1000 for every man, woman, child. And this is supposed to be annually. I guess that means Dad gets a new copy of AutoCad, Mom Photoshop, a few copies of Vista, and the kids a couple hundred CD’s/DVD’s. And that’s every year! C’mon, people … the name’s Tucker, not Sucker.
. And ya, that’s a ridiculous amount. the multiple front organizations, and the false claims they repeat. a front for the copyright lobby’s ideas. See http://www.gnu.org/philosophy/words-to-avoid.html for more explanation. Good work Michael, we will now see if the actual government is working for the people who voted for them or if it is working for the money provider corporate liars!! . The way they will proceed with this bill, will tell us. >> [damage] ranges between CDN $10 billion and CDN $30 billion. > That works out to about $1 billion worth of “theft” for each and every Canadian. Aha! I caught anti-copyright advocates advancing a false argument, therefore, the anti-copyright crowd is wrong about everything! Are there only 10-30 Canadians in Canada? I think your numbers should be $333-$1000 per Canadian. Obviously those numbers are wrong for two reasons: First, because it’s unlikely to be that much money per person, and second, the “losses” aren’t to the Canadian economy. The Canadians are largely pirating American content, so those would mostly be losses to the US. Of course, from a completely selfish standpoint, Canada might as well rip-off other countries. ..for being our voice, you are becoming a Canadian hero. Michael Geist for Order of Canada! For this is true patriot love. Why do you need to lie about Canada’s enforcement? Punishment for private copyright infringement in Canada is extremely rare, as you would find it impossible even if hard pressed to disprove. By all reasonable definitions, from this fact ALONE, Canada can be described as a ‘piracy haven’ – if something is done at will and not punished, then by definition, there is a ‘haven’ for it. Why do you need to lie about the strictness of Canadian copyright enforcement, Mr. Geist? Thanks for the excellent work Mr. Geist. Just goes to show when you have no transparency and accountability in any level of government that it feeds corruption. Corporate lobbyist with their deep pockets making contributions and deals behind close doors with politicians and high level government bureaucrats; that don’t change with the the whims of the elections. Sadly it’s not just here but all over the world. In Sweden, a shocking show trial to get rid of the “world’s largest Bit Torrent tracker”. Yet despite obvious bias in judges the decision was in made in favour of the corporations; despite not being able to prove a thing in the court proceedings. It’s a shame when corporate greed & power has more say than an individual’s right and freedoms. Copyright law is antiquated; thanks Mr Geist for helping to speed up the process. Soooo, a relatively small amount of pro-copyright groups paid many other groups to parrot their views so it would look like there is a ‘copyright emergency’, basically? I didn’t know DeviantArt shenanigans worked in real world politics. That’s cool that we are able to get the loan and that opens completely new chances. 1 – When talking about piracy the entertainment industry and politicians often use the term â€œtheft.â€ This is a huge problem according to the Swedish sociologist of law Stefan Larsson. In his thesis â€œMetaphors and Norms â€“ Understanding Copyright Law in a Digital Society,â€ he explains that these metaphors are in part keeping the wide gap between people’s norms and the law intact. Copyright owners [describe] their right as â€œintellectual property.â€ The purpose of advocating something as a property right is to take it outside of the need for any empirical, social justification. As a property right we do not ask about incentives, and we do not ask whether the property interest benefits the public. Property simply is and need not be justified. Those who own property rights are entitled to hunt down unauthorized users as free-riders, as criminals, as a threat to polite society just as surely as who break into our homes and steal our cars. “intellectual property is composed of two parts: the right of sale, and the intellectual monopoly. The first gives the producer or any rightful owner of a copy of the idea the power to sell it to another party. The second gives the patent or copyright holder the right to control and limit the usage of the idea by any other person. The latter is not just a simple well-defined right of property. It establishes a monopoly that we do not usually allow producers of other goods. We will argue that this monopoly creates many social costs, yet has little social benefit. It largely redistributes income and wealth from the many that do not have it, to the â€œluckyâ€ ones who have managed to obtain it.